Split is a historic city in Central Dalmatia, Croatia. It was originally centers around the Diocletian palace but it has grown into a large area that attracts tourists from around the world. If you're traveling alone, you'll find hostels spread throughout the area that appeal to all types of travelers. Whether you're looking for a social setting, or a peaceful oasis, you'll likely find a comfortable place to stay in Split. 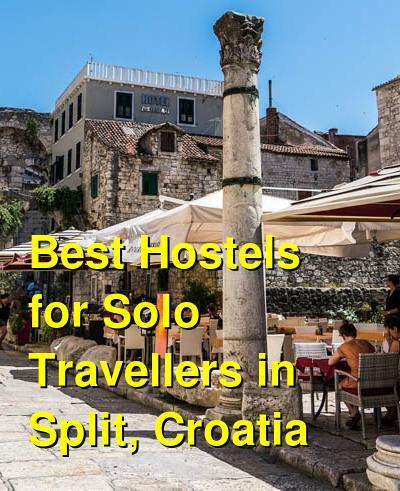 How much do hostels in Split cost? Split Guesthouse and Hostel is a favorite in the area. It's the place to go if you're traveling alone and hoping to make some friends. The hostel has the atmosphere of staying at an old friend's house. Everyone will go out of their way to welcome you and it won't be long before you're chatting with other guests. There are both private rooms and dorms available. The hostel has great amenities including a full kitchen, laundry service, and travel information. They also regularly host informal events including pub crawls, karaoke nights, and dinner nights. The staff knows the city well and they can give you all kinds of insight into the best restaurants, bars, and clubs. The hostel is one of the most social in the city, so if you're traveling alone and want to have a ready made set of friends, then look no further. This apartment style hostel is perfect for anybody who wants some of the conveniences of home while on the road. They offer both dorms and private apartments with attached bathrooms. Each apartment has a double bed, wi-fi access, a kitchen, laundry facilities, a television and air conditioning. The apartments are just a short walk from the main building. For those on a tighter budget, the dorm is quite nice as well. The hostel has a social atmosphere and the staff is friendly and welcoming. They help to organize dinner dates, where several hostels combine to mingle and enjoy food and drinks. It's a great way to meet not only guests in your hostel, but also other hostels as well. Silver Central Hostel is in a great location just a few minutes walk from the Bell Tower and Diocletian's Palace. It's about ten minutes from the bus stop. The hostel has great amenities for guests including a common room, free breakfast, and large bathroom. They can also help organize any number of day trips to national parks or nearby islands. Hostel Split is one of the most popular hostels in the area. It's in a convenient location just a couple of minutes from the main promenade and is near the market and many interesting sights. Although the hostel does not have a common area, it does have a shared kitchen. Many people use this hostel as a stopover when visiting nearby destinations. The staff can also help you organize day trips to any number of nearby sights. The hostel has a range of room types and sizes. These include mixed dorms with eight beds, doubles, twins, and apartments. Private rooms are available with attached or shared bathrooms. The staff are wonderful and can give you all kinds of insight into the city. Whether you're looking for the best place to eat or detailed transportation information, they know the area well and will have all kinds of tips and advice. This hostel is actually an apartment flat that is conveniently located in the city center. It's about a fifteen minute walk from the bus, train, and ferry terminal and is five minutes from the city's main shopping street. The hostel is smaller, with only 16 beds, but it is a clean and comfortable place to stay at a reasonable price. Despite being on the smaller size, or perhaps because of it, the hostel has a social atmosphere and it's easy to meet the other guests. There is a small kitchen that guests can share. The kitchen is equipped with a refrigerator, microwave, kettle, and dishes. that are also eager to make friends.